Every year as Christmas time approaches it seems we get an influx of emails asking what camera to buy or other gift ideas for family/friends who love photography. We truly love helping others find the perfect gift for their loved ones and to better serve everyone we thought we’d put together a gift guide in one place! For all of those who asked what camera you should buy your son, girlfriend, grandma, or spouse we put together a quick cheat sheet for the best cameras, accessories, and inspiration for the aspiring photographers in your life. 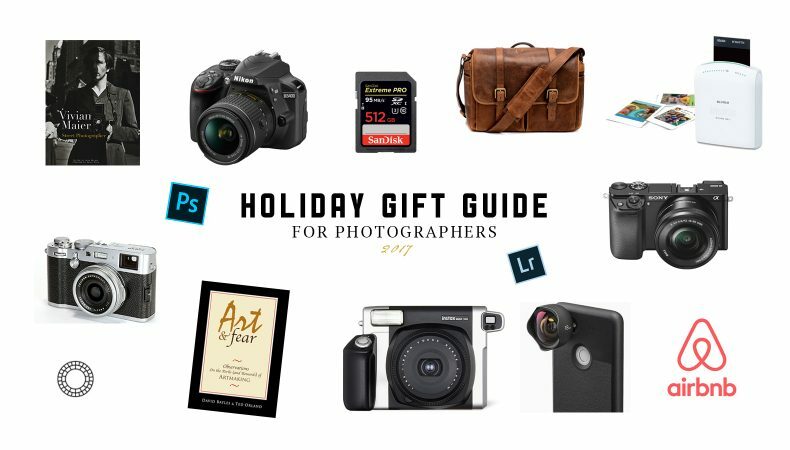 Gift suggestions are broken out below by categories (and cameras by budget). Happy gifting! What do I plan on using this camera for most often (capturing daily life, photographing your kids, landscapes, travel, starting a video blog, etc)? Because of how I plan to use the camera, what features are important to me (quick focus, ability to change lenses, video capabilities, full frame sensor, ability to shoot in RAW, etc)? If you’re looking for professional quality cameras or lenses, check out the post about our photography gear. The perfect read when you need a little push. One of our favorite books for facing our fears and learning to express the truest version of our art by way of knowing ourselves – as artists, a spouses, a parents, and fellow humans. This book is such a great, classic resource for helping reignite your creative spark and tap into who you are as a unique creative individual. She teaches practical tools like making space every morning (with what she calls “morning pages”) for all of those random thoughts and ideas that steal your energy, how to incorporate and “artist date” into your week, and overall… she guides you through how to feel more focused and confident in your own creativity. The book is designed as a 12-week “program” to rediscover the inner creativity that exists in all of us — not just those who would call theirselves artists. Need help figuring out what to do with hands, how to guide people, or simply how to make people feel like the best version of their self? This book is such a great resource for understanding the basic principles of posing so that you can think less about posing and more about how to make whoever is in front of your lens feel more comfortable and confident in their own skin. If you haven’t heard of Vivian Maier, do yourself a favor and google the video about her. Essentially, she was a nanny back in the day who carried her camera around with her everyday–documenting the world around her, creating captivating self-portraits, and exploring her craft. The kicker to the story… her work wasn’t discovered until years after she passed away. These handy little lenses (made with cinema quality glass) attach to the camera on your phone to allow you to create stunning images using nothing other than your phone! Architecture / Real Estate: Capture a wider view of interiors or the full height of a skyscraper. Video: Add context to any scene while combating the cropping that happens on mobile videos. Portraits: The natural drop off and 60mm focal length is ideal for shooting people. Dramatic Landscapes: Focus on the details with tightly cropped landscapes that blur on the edges. A fun an easy way to have tangible images of your favorite moments! Think mini “polaroid” prints from your phone! disclaimer: while we do receive a very small referral fee should you choose to purchase any of the items from the links, 100% of these thoughts and opinions are our own. these are products we actually believe in and this post was written first and foremost to help serve the photo community.